The Coeur d’Alene Mountains: haven’t they suffered enough? Mountains, like people, are largely ignored if they haven’t achieved at least some degree of celebrity status, and the Coeur d’Alene Mountain Range of Idaho and Montana, lacking that status, has been more than simply ignored; it has been severely exploited for decades. This triangular shaped, heavily forested range extends from Idaho’s Lake Pend Oreille southwest to Coeur d’Alene, Idaho, south to St. Joe, Idaho and southeast to the majestic Bitterroot Mountains of Montana. It occupies a large amount of the geography of north Idaho and a swath of over a hundred miles through northwestern Montana, and is managed (or at times mis-managed) in pieces, by the administrators of four National Forests: the Lolo, the Kanitsu, the Coeur d’Alene and the St. Joe National Forests. Just down-slope from Thompson Pass on the west side of the range, the devastating results of large-scale placer mining can still be seen today in the huge piles of barren river rock scarring the creek bottom around Murray Idaho. Sadly, Montana has been only slightly less unkind to the Coeur d’Alene’s: the exploitation and damage here along the northern slopes has been largely caused by poorly controlled or uncontrolled logging. In the photo that follows the remains of a few very old clear-cuts can be plainly seen on the lower slopes: they are at least a hundred years away from full recovery. 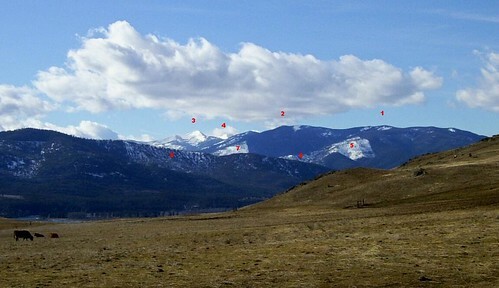 The numbers 5 through 8 in the photo are difficult to read, but they are the four lower red marks and they point out these areas. Way back inside the Coeur d’Alene’s just across the Clark Fork River from my home there is a 35 square mile area that has long been managed as non-motorized. There are no roads and only a few trails. Besides beautiful mountains peaks and heavy forest, this small area provides the headwaters for 10 creeks and contains two small lakes. It is prime habitat for deer, elk, moose, cougar, lynx, wolves, black bear and bighorn sheep. Mountain goats, wolverines and Grizzly bears are also a likely possibility there. The new Lolo National Forest Draft Plan opens this entire area to snowmobile use and opens a large portion of two of the creeks (upper Cameron and Lynx Creeks) to timber production and off road vehicle use, essentially stripping the area of its existing Forest plan protections. I and many conservation-minded Montanans oppose this plan and I intend to be active in getting it changed. In two to three months (when the present 10 feet of snow up there has mostly melted) I will be making a three-day backpack trip to visit the four peaks in the photo. Again, the numbers 1 through 4 are difficult to read, but the peaks from right to left are: Sunset (6355 ft), Sacagawea (6612 ft), Cherry (7352 ft) and Penrose (7232 ft). (These are not high elevation peaks, but they are nearly a mile closer to the sky than the valley floor along the Clark Fork.) There is an old road (closed) that passes near the first two and a trail (sort of) from Sacajawea to Penrose. Cherry has no road or trail and I’m just hoping I can figure out how to reach it after I spend a night atop Penrose. My topographic maps show there is a pretty good chance of being able to reach it. Upon my return I shall write some stories about the country up there and illustrate them with plenty of photos. Since that wild country is seldom visited by humans, perhaps providing a different perspective can give the 99.99% who have never been there at least some idea of what it’s like and what some of the impact of the changes would be. Hopefully these stories will help gain more public support for keeping the area non-motorized. These mountains have suffered enough. In 1992 a billionaire developer bought 140,000 acres of Montana’s wild country near Big Sky from the Plumb Creek Timber Co. and built the ultra-exclusive Yellowstone Club, a members-only ski and golf resort, featuring homes with $1,000,000 minimum price tags. Fees for Club Membership alone are $300,000. Now under construction is a 53,000 square foot house complete with its own ski lift that can be boarded from inside the house, and it accesses one of the largest ski areas in Montana, but this one is private. Price: $155,000,000, setting, in my opinion, a brand new record for a rich man’s arrogance. 218 square miles of wild country is now gone forever, having become an exclusive playground for the absurdly rich. Plumb Creek Timber Co. now plans to sell 10,000 acres of the 80,000 acres it owns in the Swan Valley of Western Montana for private development. (10,000 acres is the equivalent of 15.6 square miles. If the shape of it were to be roughly 3 miles by 5 miles, it would take a darn good hiker over 5 hours of solid hiking just to walk around it.) The Swan valley has seen residential building for many years on small spots of land back in the woods, but in the last few years, the property sizes have gotten much larger and today’s newcomers have a different idea of their homes and the land around them. They want to see the rugged Swan Mountains and so they simply get rid of the trees, often a section (one square mile or 640 acres) at a time. The results in terms of the natural beauty of the place and the impact on the wildlife there are nothing short of devastating. (The impact on the wildlife does not affect that area alone, but because it also alters their natural migration routes its impact will be felt for hundreds of miles around that specific area.) It seems to me it’s another huge example of modern man’s greed, selfishness and arrogance. As I read these stories in the news and witness first-hand the wanton destruction of and the selfish disregard for the natural world in this “Last, Best Place” I can’t help but think of the men who lived here in the past and truly loved this land now called Montana. A brief list of just a few, chosen at random and in no particular order, includes: Chief Joseph (Nez Percé), Chief Looking Glass (Nez Percé), Chief Two Guns White Calf (Blackfoot), Chief Sitting Bull (Lakota/Sioux), Chief Gall (Lakota/Sioux), Chief Dull Knife (Cheyenne), Chief Little Wolf (Northern Cheyenne), Chief Plenty Coups (Crow), Chief Rain-In-The-Face (Hunkpapa Sioux). These were real men, true leaders of their people who cherished the natural world in which they lived. I’m glad they’re gone, because, were they here today to see what I see, I couldn’t bear to look into their eyes and see the sadness there.